Award winning sculptor and jewelry designer Cherise Thomson creates strong, organic forms inspired by her homeland’s raw natural beauty. In 1968, a group of Waikato farmers offered their local bank a coil of copper wire as collateral, and Fielday's was born. Origin '68 seeks to represent the cycle of interconnectedness, inspiration and growth that has resulted from the founders original vision 50 years ago. A huge copper coil with twelve sweeping loops, references the seasonal life of farming and symbolises the many years of dedication by Fielday's volunteers and staff since the inaugural event in 1968. 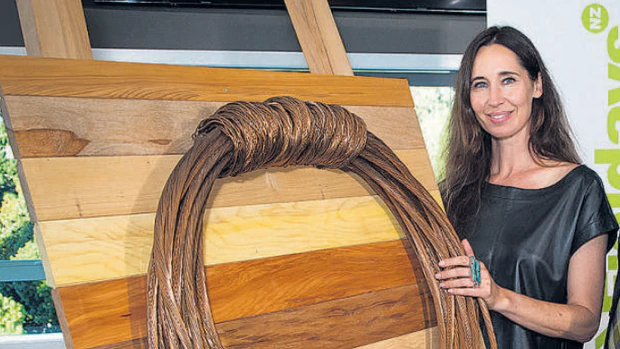 Beautiful New Zealand native wood panels, reclaimed from the old Fielday's boardroom, frame the copper coil and evoke the walls of a classic farmers shed. The warmth and beauty of each piece of native timber, a tribute to the many thousands of unique individuals who have built the enduring success of this beloved New Zealand organisation. Material Origin: Reclaimed copper communications wire, sourced in New Zealand. Reclaimed New Zealand native timber, sourced from timber that used to line the old Fielday's boardroom. (Rimu, Rewarewa, Tawa, Kajikatea, Totara, Birch, Taraire, Towai, Puriri, Kauri, Beech). Special thanks to: Peter Nation for the original concept. Reg Laurie and Lance Enevoldsen, for their creative collaboration and expertise. ‘Ao' is one of the many names Māori have relating to clouds and cloud formations. Ao was inspired by a single moment observed in the ever-changing sky over the Auckland isthmus. One-of-a kind handwoven wire sculpture. Cherise Thomson with James Russ at the opening of the James Russ Gallery. After Inflorescense is to the right. 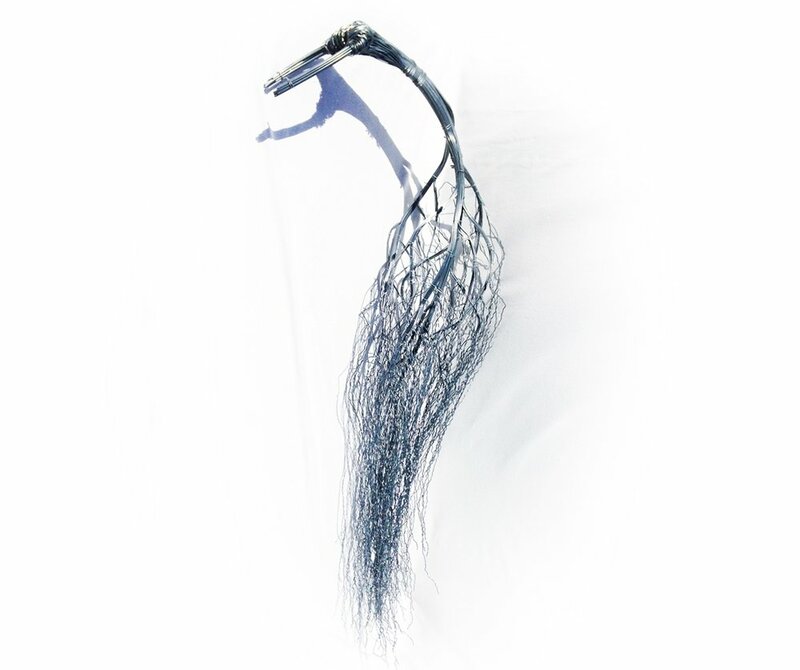 A finalist at this years Waikato Museum Fieldays No 8 Wire National Art Award, After Inflorescence reflects on the beauty and complexity of these coral-like palm branches after flowering. Now on display at the brand new James Russ Gallery. The cycle of interconnectedness is revealed in Whenua – the land, earth or placenta – the afterbirth from Earth’s mother Papatūānuku. In 1962 my mother was gifted a beautiful korowai after working at Rotorua's Public Relations Office. She left New Zealand soon afterwards to travel and live overseas. I grew up with this korowai hanging on the wall of every home we lived in, and since inheriting it I have done the same. Wherever we lived in the world it symbolised my mother's love for New Zealand, Māori culture, and her memories of growing up on a sheep farm in Palmerston North with five brothers and sisters. My sculpture 'Korowai' is a tribute to my memories of my mother, to the grace and beauty of this traditional Māori art form – and to early settlers like my great grandparents and grandparents who tirelessly attempted to bend and shape the land (and endless spools of No.8 wire) to their will. Korowai now hangs in the Fieldays Boardroom at Mystery Creek, Waikato. 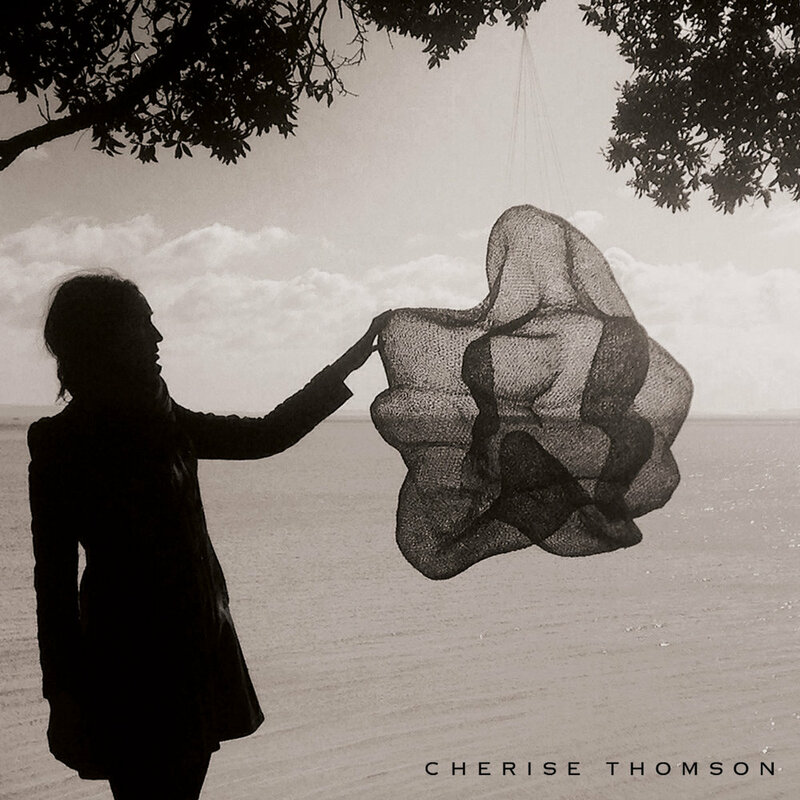 > Listen to a brief interview with Cherise while setting up for the Fieldays No.8 National Art Award. Taniwha Moana is inspired by the guardian ocean spirit that Māori believe traveled with the original canoes from Hawaiki to New Zealand. "I collected Kina on the beach as a child, and I've long admired the surprising beauty and fragility hidden beneath the Kina's spiky exterior."